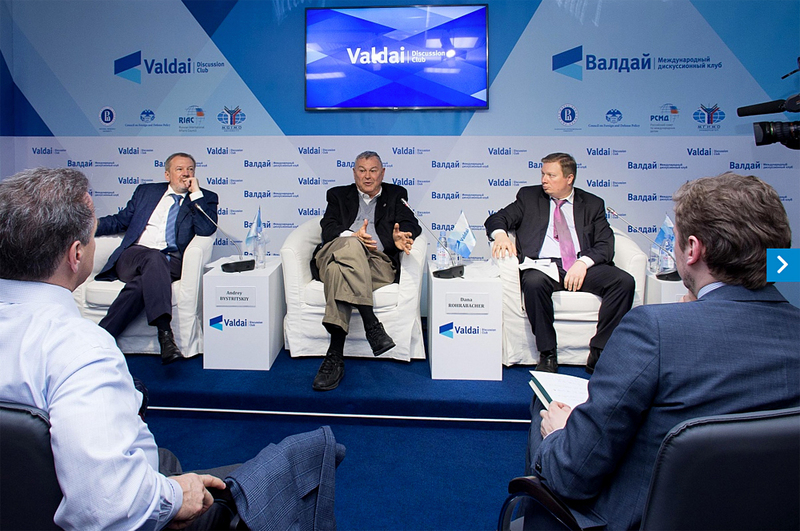 Chairman of the Foundation for Development and Support of the Valdai Discussion Club Andrey Bystritskiy, Member of the U.S. Congress (California) Dana Rohrabacher, Programme director of the Valdai Discussion Club Dmitry Suslov. The Russian media spoke with several members of U.S. Congress following their recent visit to Moscow – and RBTH collected some of their most notable quotes on Ukraine, Syria, Russia’s economy and military spending, and its future. At the beginning of April, Moscow was visited by a U.S. Congress delegation led by Republican Dana Rohrabacher. The congressmen participated in a meeting of the Valdai Discussion Club – a forum focusing on political, economic and social dialogue between Russian and international elites – and spoke to the Russian media afterwards. According to Rohrabacher, the conflict in Ukraine that began in 2014 could have been avoided if the revolutionaries on Maidan Square in Kiev had waited for the next election. Democrat David Cicilline and his fellow party member Brian Higgins did not agree with this assessment. "The Ukrainians have the right to choose their own future, and Russia should not have interfered in the conflict," said Cicilline. Is a Trump presidency in Russiau2019s interests? Views were divided on the operation in Syria as well. Cicilline insisted that "Moscow's goal was to keep [Syrian President] Bashar Assad in power." "Most Americans are happy that Bashar Assad has not been replaced by a radical Islamic jihadist," Rohrabacher replied to him. "The opinion that he would have been replaced by the democratic forces is naive." Consensus was reached only in answering the question on what the Americans would want Russia to be like in 10 or 15 years. "Strong, democratic and prosperous, respectful of the rights and freedoms of its citizens," said Democratic Congressman Juan Vargas from California. "We are very concerned about the gradual extinction of Russia, because countries that find themselves in a weak position can become easy prey to the radicals." Vargas also said in an interview with the Izvestiya daily that Congress "has a suspicion" in relation to Russia. "It appears that you have decided to invest in the armed forces, not the economy. This unnerves many in the world," said the politician. "Your neighbors are very nervous, because they see what you are capable of. Each of them seems to be a little afraid that the Russians would move forward again." At the same time, he added that there was a "fantastic cooperation in the space field" between the countries and he hoped that relations with Russia would improve with the arrival of a new U.S. president." Democratic Congressman Brian Higgins from the State of New York told the Kommersant business daily about his vision of relations between the U.S. and Russia. "Russia has a lot of achievements, but, unfortunately, they may find little application in their home country," he said when asked about Russia's main problem. "You have not yet found a way to make your economic model sustainable, to ensure the growth, create jobs and attract your best people to work for the good of their country. And this does not make us happy at all; we would like to see a strong and prosperous Russia, with which to share the burden of the world's problems," said Higgins on the economic situation in Russia. The congressman said that the introduction of sanction against Russia "was inevitable, and it was caused by the Russian aggression in Ukraine." Responding to a reporter's question on the review of the U.S. strategy in the Middle East, Higgins said that the U.S. "really left Iraq and Libya in a worse state than they were before us." "In Iraq, things turned particularly ugly; we wanted to establish a real Jeffersonian-type of civic democracy there, but got the Shiite government, which immediately fell into the orbit of Iran. We did not want it, but it happened," he said.